We love a grand gesture. A dramatic invitation can be a first glimpse into a lavish event. It can create anticipation and build excitement for guests before they even arrive at the party. Scriptura has worked with event planners, debutantes, celebrities, and countless blushing brides to create invitations tailored specifically to their needs. We love to dig in and to do something unique and oh so special, with every detail considered. We have a team of designers and illustrators who can really make your ideas come to life. 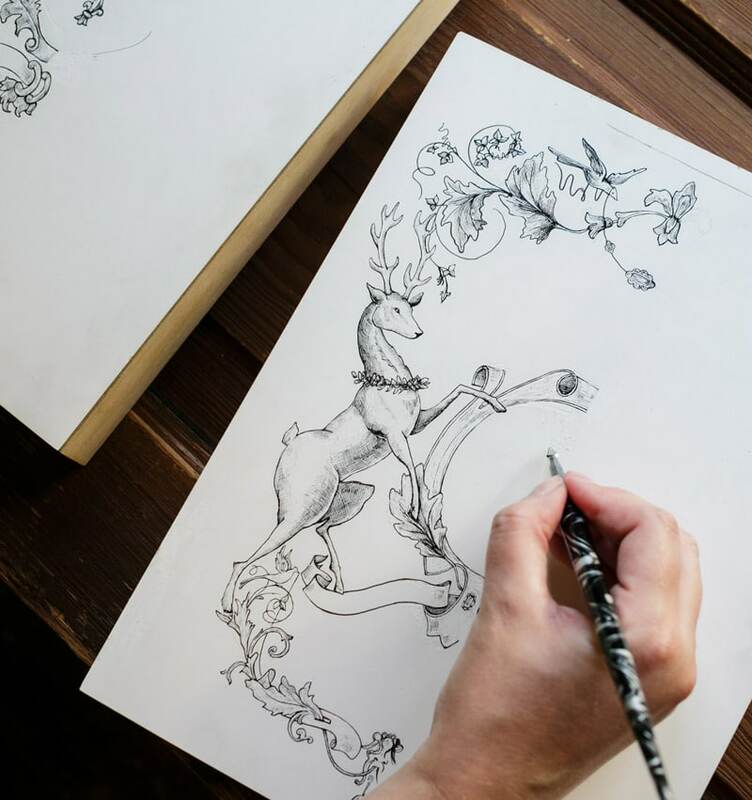 When a family presenting their daughter came in with the idea of a “Bal de la Chasse” or “Hunt Ball”, we began by creating an elaborate crest with stags and laurel leaves. We commissioned a custom handmade paper that was stained with coffee to look antique, scoured antique type catalogues to find the perfect mix of typestyles, and then printed the design in our letterpress studio. The envelope was sealed with a wax seal featuring a custom monogram. We love a good theme at Scriptura. Taking an artistic journey on the Orient Express with Fleming, Talley and Sarah Jane was the trip of a lifetime. Enjoy this peek at our hand drawn and intricately folded invitation honoring these lovely ladies – each invitation opened from a diamond shaped front to reveal a map of the Orient Express route. With a theme of Midsummer Night’s Dream, we created an intricate wreath of flowers and fairies. Titania flirts with Bottom while Puck, the mascot of the krewe, looks on with a smirk. Inspired by the look of antique chromolithography, we made sure to give a soft, hand-drawn feeling to the illustration. For a rehearsal dinner for a man who enjoyed the outdoors, we created an ornate border featuring his family crest. To make things even more personal, we added design elements pulled from an heirloom shotgun owned by the family. Finishing this design was simply the opening chapter of an incredible story. This evening honoring Mary Elizabeth Conwill transported all of us to Neverland. We were accompanied to Neverland by quite the cast of characters. While drafting we encountered pirates, alligators and a mermaid who looked suspiciously like Mary Elizabeth Conwill. We eventually made it home but still refuse to grow up! For the most elegant of deco wedding designs, we started with the monogram combining the couple's initials into a starburst pattern. Once the design was completed, we foil stamped it onto the most gorgeous heavy black board. Notice the attire recommendations: a crowd of lovely people dressed in glamorous metallics sounds just dreamy to us. Gatsby himself would be proud. For a party with the theme of a famous horse race in Siena, Italy, we wanted guests to feel like they were a part of the action. To this end, we created an elaborate illustration in multiple layers, that popped up when the invitation was opened. The request: create a masked ball invitation that helped guests get into the spirit of the event. The result: we designed a theatrical spinning invitation giving guests one of twelve "roles" for the evening. The invitation was sent inside a custom box that also contained a costume element for the chosen character. Guests were given the option to either accept, or to "deny the role that fate has handed out, and instead choose the role of .........."
“Fashion can be bought, style one must possess.” With that in mind, this chic invitation offered a nod to the gorgeous style of this budding fashion-designer. Each invitation included a hand-sewn tag with the debutante’s name, and the hope that one day her clothing line will be a reality. You often know if a party is going to pop the moment you open the envelope. This invitation honoring Shelby White featured two die-cut palm trees that literally popped right off the page under the canopy of a pink and white tent. White dinner jacketed guests extended greetings to mermaids while walking through sand and dancing to Bahamiam junkanoo bands. The party truly begins with the invitation. For Britt and Byron’s rehearsal dinner, Scriptura developed a paper trousseau based on their mutual love of African landscapes and wildlife. Email us at info@scriptura.com and tell us about your needs. Have an inspiration image, or 20? We’d love to see them. Feeling overwhelmed? We can guide you towards a theme. Once we have an idea of your overall concept, we will create a proposal and begin designing the perfect invitation for you.